When Jawbone came out with the Jambox back in 2010, the sales pitch was simple: here was a really loud Bluetooth speaker that was small enough to stuff inside a backpack when you wanted to have a dance party at the beach. (Okay, we're paraphrasing a little bit.) Three years later, though, "small enough to stuff in a backpack" isn't quite small enough. What about small enough to fit inside a suit pocket? Or a purse? That's the promise of the Mini Jambox, a $180 speaker announced today that's -- you guessed it -- even tinier than the original. If the idea of another Jambox seems redundant (as it did to us at first), Travis Bogard, VP of Product Management and Strategy, says you should think of it like a camera: "It's kind of like 'the best camera is the one you have with you." The idea is that you'll carry the Mini Jambox at all times, in the event you're, say, hanging out with a friend and decide to watch a movie together on a tablet. But if you mainly want something for home use, the Big Jambox will be the better choice. That leaves the original Jambox in a strange place: Bogard expects you'll use that at home too, even if you do occasionally trot it out for picnics in the park. You just wouldn't keep it on your person at all times; it's a little too large for that. As you'd expect, the Mini Jambox pumps out surprisingly loud sound, given its petite frame. What's interesting is that the unibody aluminum casing (designed by Chief Creative Officer Yves Behar) acts as both an enclosure and an acoustic cavity for the two internal drivers. That helps explain why the speaker is as small as it is (6.06 x 2.88 x 0.96 inches). Despite its size, it also promises the same battery life as the regular Jambox: about 10 hours of playback. In our listening test, we found that the audio quality was certainly better than what you'd get from an accompanying smartphone or tablet (or even laptop), though if you listen hard enough you will detect some tinniness. All told, the speaker seems to fare best with softer sounds like vocals and acoustic guitar; it's with pop music and electronica in particular that the sound takes on a slightly brittle quality. To be fair, we only listened to five tracks during our demo session, so we'll definitely be revisiting this once we spend some time with an actual review unit. Like the bigger Jambox speakers, the Mini version makes use of Jawbone's Live Audio technology to enable a wider soundstage, creating the illusion that sounds are coming at you from different directions. Whereas that feature comes automatically installed on the Big Jambox, though, in this case you'll need to install it as a software update. Once you do, Live Audio will still be disabled by default. To turn it on, you can press a button on the top of the speaker, or enable it inside Jawbone's new music player app. Speaking of which, Jawbone also released its first-ever music player app. Available for iOS and Android, it acts as a repository for every playlist you've created, whether it be on Rdio, Spotify or iTunes. The catch: the streaming bit doesn't yet work on the Android app, though you can still use it to listen to your locally stored music. Also, more music services will be added later, we're told. Additionally, as we mentioned, you can use the app to turn Live Audio on and off, and there are also different voice options for the built-in audio prompts. In any event, the app is free and has a slick UI, so no harm in giving it a try. SAN FRANCISCO – Sept. 4, 2013 – Jawbone®, a leader and innovator in smart audio devices and wearable technology, today announced MINI JAMBOX™, a new addition to its best-selling JAMBOX® family of Bluetooth® speakers. MINI JAMBOX goes everywhere to add remarkable sound to every occasion. It lets you enjoy and share all of your content – movies, TV shows, games, music and calls – out loud from your phone or the cloud at any moment, completing all of your entertainment experiences with great wireless audio. "At Jawbone, we believe in creating products that make daily experiences better – that's why we created MINI JAMBOX," said Travis Bogard, vice president of product management and strategy at Jawbone. "MINI JAMBOX goes with you literally everywhere and lets you take advantage of the spontaneous moments when you want to enjoy or share your entertainment, like streaming from Spotify on a road trip, showing friends a trending Vine clip at a party, or calling your family via Skype while honeymooning in Europe. Since you already watch and listen to most of your content on your phone or tablet, the best speaker is going to be the one that's always with you. With MINI JAMBOX, you'll have great-sounding audio wherever you are." MINI JAMBOX is crafted from a single piece of extruded aluminum that makes up both the framework and the face of the speaker, simultaneously producing its audio and its iconic industrial design. Inside the aluminum encasement, a rigid, airtight enclosure creates a maximally efficient acoustic cavity for producing sound. Outside, the precisely sculpted aluminum exterior exudes an innovative blend of high tech and high design. "Jawbone's rich history of expertise in design, technology, hardware and software has allowed us to deliver a speaker that's smaller, lighter and louder than ever before," said Yves Behar, chief creative officer for Jawbone. "Its unibody aluminum chassis is a complete redesign of our iconic JAMBOX and our most avant-garde speaker design yet, allowing us to pack even more sound and technology into a significantly smaller and more portable package." Inside its compact nine-ounce package, an airtight enclosure features two neodymium drivers and a passive bass radiator to produce the highest-quality sound for its size. Using advanced digital signal processing technology, MINI JAMBOX is optimized to play all types of audio content and all genres of music with the fullest sound possible – movies, games, voice, and music from hip hop to classical. A built-in, rechargeable lithium-ion battery delivers up to 10 hours of continuous playback and 75 hours of standby time on a single charge. MINI JAMBOX comes with a free Jawbone application for iOS and Android that lets you customize MINI JAMBOX and curate the playlists you love right from your smartphone or mobile device (playlist services currently available on iOS only; coming soon to Android). Simply add your iTunes, Rdio, and Spotify music libraries to the Jawbone app to access all your favorite playlists in one place, and seamlessly switch back and forth between services with the swipe of a finger. The new Jawbone app also lets you personalize the name of your MINI JAMBOX and quickly demo the 11 voices and 8 language options for the voice prompts on your speaker. Customize the Talk button on MINI JAMBOX via the Jawbone app to initiate a variety of different functions, like activating Siri or automatically dialing your favorite contact. Because MINI JAMBOX is equipped with a high-quality Type-1 compliant speakerphone, you can enjoy and share crystal-clear calls or video conferences out loud from any location. MINI JAMBOX can also be updated with LiveAudio™ – Jawbone's immersive, three-dimensional listening experience – directly from Jawbone.com. Turn it on to experience movies and games as if you're right in the middle of the action. And, as other features and services are released for the updateable SmartSpeaker™, MINI JAMBOX will become even better over time. MINI JAMBOX is priced at $179.99 and comes in nine eye-catching designs (Red Dot, Silver Dot, Graphite Facet, Blue Diamond, Aqua Scales, Purple Snowflake, Yellow Dot, Orange Dot, and Green Dot). It is available for pre-order beginning today at Jawbone.com and at major retailers nationwide and online later this month. The Jawbone app (for iOS and Android) is available today as a free download from the App Store and on Google Play™. Streaming and playlist services, currently available on the Jawbone app for iOS, are compatible with all Jawbone speakers and third-party audio devices. Streaming and playlist services on the Jawbone app for Android will be available soon. 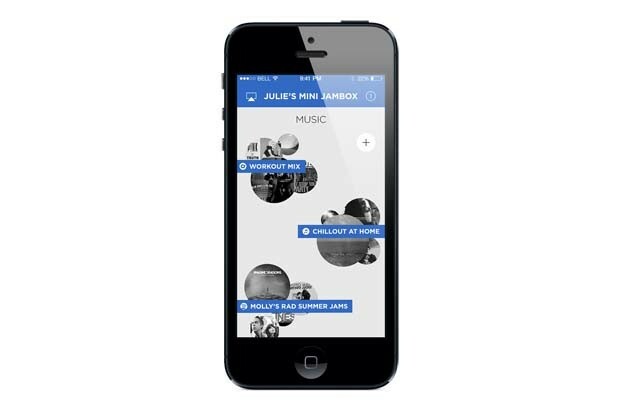 Customization tools on the Jawbone app are exclusive to MINI JAMBOX. For more than a decade, Jawbone® has developed human-centered wearable technology and audio devices that solve everyday problems and help us live better. A 2010 IDSA Design of the Decade winner, the company is the creator of the best-selling JAMBOX® and BIG JAMBOX® wireless speakers, the award-winning Jawbone ERA® and ICON™ Bluetooth® headsets, and NoiseAssassin® technology. Jawbone's approach to lifestyle tracking is unique, with over 240 patents filed related to UP® and its wearable technology manufacturing processes. Jawbone is privately held and headquartered in San Francisco. Jawbone®, UP®, JAMBOX®, BIG JAMBOX®, Jawbone ERA®, ICON™, MyTALK® and NoiseAssassin® are trademarks owned by AliphCom dba Jawbone. Other company and product names may be trademarks of their respective owners.